Located in Portland, Oregon we are the first and only pour over specific coffee concept offering a rotating menu of local roasts that are curated by our staff. We have set out to offer a premium lineup of coffees whereby each is brewed in the traditional pour over method to its individual needs as each coffee has its own recipe to maximize sweetness and complexity of flavor. Portland, Oregon is a very latte-centric city, despite having one of the highest density of premium coffee roasters in the nation. 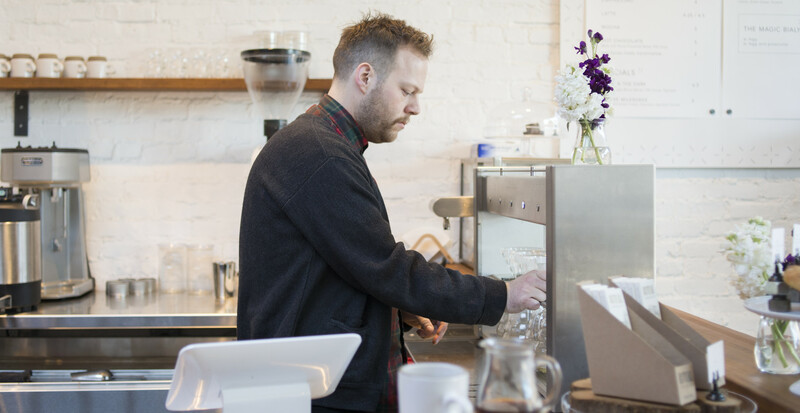 While analogous cities (for example Seattle, Washington or San Francisco, California) have a wide variety of premium brewed-coffee available, Portland has very little to offer in this space. I have always enjoyed pour over coffee much more than espresso and have been a long time home brewer of coffee. I have been frustrated when trying to find a great cup of coffee in Portland, as typically the only options available are espresso drinks and batch-brewed coffee which tends to only have one impactful flavor. I realized there was an opportunity in Portland to sell coffee that highlights the depth and complexity that a quality roasted coffee has to offer. In other words, I saw a market niche that has yet not been filled in Portland. To best cater to customers that seek high-quality coffee roasts and dedication to nuanced flavor I decided to serve coffee only using the pour over technique. It is ideal to extract subtle flavors, which leads to a complex cup of coffee, showcasing what the fruit has to offer. Pour over is a labor-intensive brew style. Each coffee requires several individual pours of hot water, with time in between for the water to fully saturate and drip through. The purpose of this is to evenly wet the grounds, providing an even extraction of oils/flavor compounds. Additionally, it is best to utilize a rotating pouring motion in order to disturb the bed of coffee grounds consistently. This avoids ‘channeling’ of water, which would not evenly wet the grounds and result in a very uneven extraction. This dedicated process takes, on average, 3.5 to 4 minutes and must stay within predetermined limits. As labor cost is the highest cost factor in profit & loss (P&L) statements of coffee shops I realized that automation is the only option to offer this labor-intensive product in a way to sustain continued business success. I was specifically concerned about the high minimum wage set for Portland; that is $11.25/h since July 1, 2017; $12/h starting July 1, 2018. Having baristas tend to each cup while not being available to cater to the needs of other customers would not allow for a profitable business model of only pour over coffee servings. 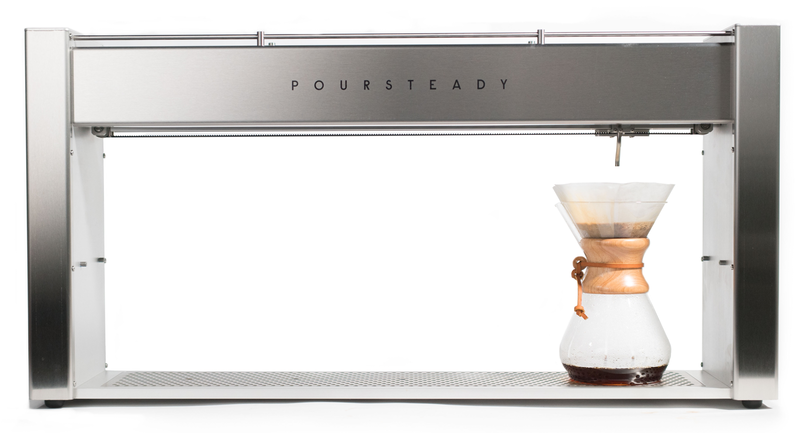 Our solution is a machine called the Poursteady which is produced by a couple of engineers in Brooklyn who handmake each machine in their shop (www.poursteady.com). The machine is app-controlled, allowing to set water temperature, flow rate, and nozzle pattern to ensure the precision and repeatability required for the best flavor development of each roast we serve. The machine allows one barista to accurately brew up five drinks at once, which would simply be impossible if done manually. The machine, thus, frees up baristas from tending to five cups sequentially to catering to customers and offering and selling pastries, coffee beans and other products. As such, while the high machine costs are high, they are quickly recouped given the savings in labor cost. This is particularly the case for Portland, Oregon which has a high minimum wage. We have our work cut out for us, as many Portlanders are unfamiliar with the pour-over method, assuming that it is “just black coffee” no different than a batch brew, which can be found nearly everywhere at a lower price point. This means that staff has to “sell” every customer on the pour-over method by informing them of the superior quality of the product. By now word of the pour-over method has spread and several new customers are already familiar with the process and advantage of pour over coffee and are thrilled to finally have an option in Portland. I believe that the shop opened in time to capture an underserved market. The machine itself is an attraction as well that fascinates some of our customers.